Every couple of weeks, I spotlight a college I have visited in my blog. These posts are not meant to be an exhaustive discussion of the school; rather, I hope to share my impressions, point out some interesting facts about the college, and perhaps prompt my readers to look at the school a little differently. 1. My first impression of Penn was that while it is extremely urban, the center of campus is a green oasis in the middle of Philadelphia, with trees, grass and walking paths. Locust Walk in particular was a lovely respite from the busy streets just yards away, as you can see in the picture above. They take security seriously, though. If you want to take a tour, you need to sign up ahead of time and get a wristband, or else you won’t be able to enter the buildings on the tour. 2. Penn has a strong focus on interdisciplinary study. According to their website, 30% of undergraduate Wharton students earn more than one degree. Students at Penn can pursue a dual degree, meaning that they receive two Bachelor’s degrees, from two different schools within Penn. They can also take part in one of Penn’s coordinated dual degree programs, such as the program in management and technology offered through Wharton and the School of Engineering. Penn also offers interdisciplinary minors, for those students who don’t want to undertake two complete degrees. For more information about Penn’s interdisciplinary programs, click here. 3. Many people know that after the third quarter of Penn football games, during the Penn fight song, students throw toast onto the field. The tradition started when alcohol was banned at the stadium and undergraduates could no longer toast the team with a drink. What many people may not know is that, according to my guide, some Penn engineering students invented a “toast Zamboni” that cleans up all the toast at the end of the game. For more on Penn traditions, follow this link. 4. 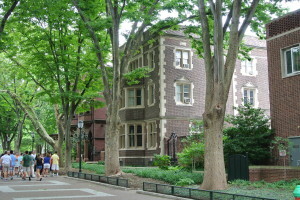 Penn has a strong Greek culture, with 48 fraternity and sorority chapters on campus. 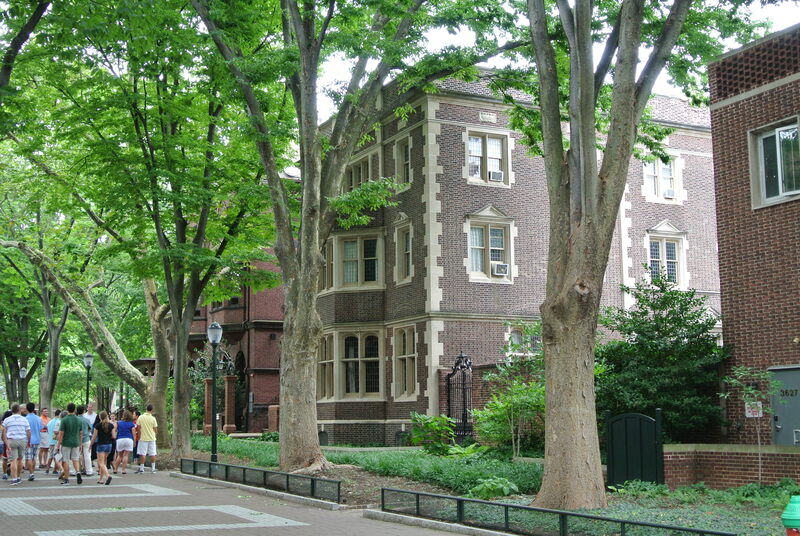 Over 28% of the students at Penn belong to a fraternity or sorority. Penn has spring rush, so freshmen have the opportunity to experience Penn for a semester before deciding whether or not to join a chapter. Click here to learn more about Greek life at Penn . 5. 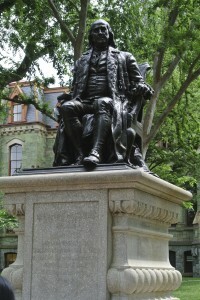 There are at least four statues of Penn’s founder, Benjamin Franklin, on the campus. 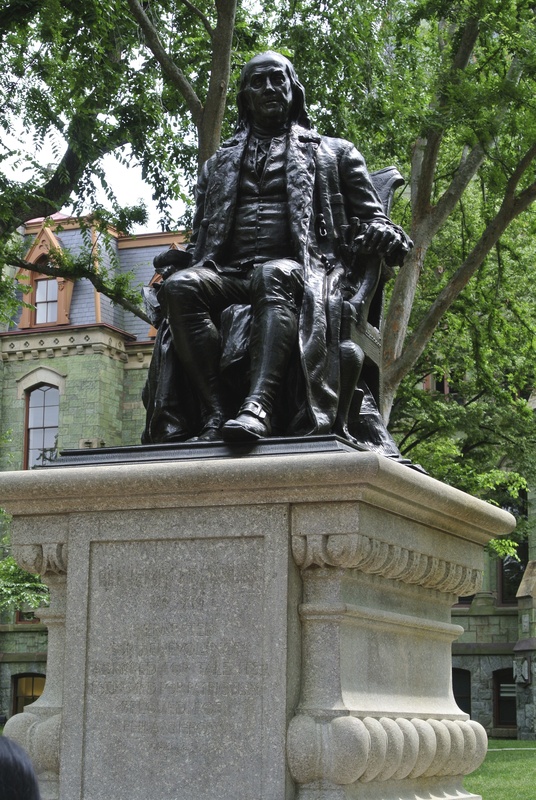 They vary from a bust, to a statue of young Franklin, to the informally posed Franklin reading a newspaper on a bench on Locust Walk, to the formally posed statue in front of College Hall (seen in the picture to the right). Directly across from this formal statute, right in front of the main library, is a modern sculpture called “The Button.” Penn lore has it that it symbolizes one of the buttons that fell from Franklin’s vest after a particularly heavy meal. For more information about Penn’s art collection, follow this link. Philadelphia is a great college city, with the fifth highest concentration of college students of all cities in the United States, and Penn students can take advantage of all Philadelphia has to offer. If they want to go further afield, New York and Washington are only short train rides away. When thinking about colleges, don’t forget to look into the University of Pennsylvania.